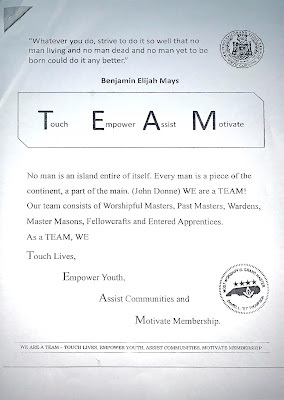 Since 2011, the brethren of Mt. Nebo Lodge 91 in Shepherdstown, West Virginia have graciously permitted their 234-year old George Washington Masonic apron to be displayed to the general public during President's Week each February at Washington's Mount Vernon Estate in Virginia. Young George Washington was initiated, passed and raised as a Freemason at the Lodge of Fredericksburg, Virginia between 1752-53. According to the story provided by the lodge, after the end of the American Revolutionary War, the Marquis de Lafayette allegedly presented his friend Washington this French-made silk Masonic apron while visiting Mount Vernon in 1784. 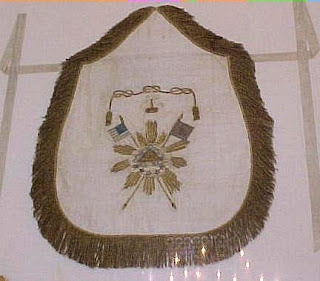 The hand-embroidered apron features a square and compass, the crossed flags of France and the new United States, a memento mori, sprigs of acacia, and a tessellated cable-tow tied with three knots, referred to by French Masons as la houpe dentelee, which represents the mystic tie that binds all Masons in brotherhood. After Martha Washington’s death in 1802, this apron is believed to have been purchased for six dollars from her estate by Thomas Hammond, husband of George Washington’s niece, Mildred Washington. It was given to the Mt. Nebo Lodge in West Virginia prior to Hammond’s death in 1820. The apron may be seen on display this week (February 15 - 24, 2019) at Mount Vernon's Donald W. Reynolds Museum and Education Center. Admission to the Museum is included with general admission to the estate. For more information, see the Mount Vernon website HERE. This Saturday, February 23rd, the brethren of Mt. Nebo Lodge will hold a wreath-laying ceremony at Mount Vernon. The ceremony will begin at 1:30PM and will feature a prayer from their Masonic funeral service. Of course, as with other relics alleged to have belonged to the nation's first President and most famous Freemason, the Mt. Nebo apron is not without its skeptics. It is remarkably similar to the the 'Watson-Cassoul Apron' that was presented to George Washington in 1782 by Elkanah Watson of Plymouth, Massachusetts and Monsieur Cassoul of Nantes, France. Washington chose to wear the Watson-Cassoul Apron when he famously laid the cornerstone of the United States Capitol building in 1793. That famous apron is owned by Virginia's Alexandria-Washington Lodge No. 22, and the Mt. 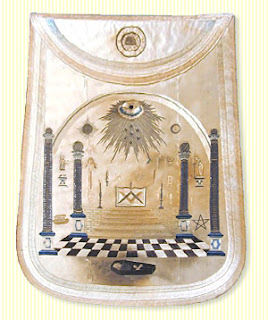 Nebo apron looks to be almost identical in design, although of slightly rougher quality and different details (the skull and bone instead of the 'All Seeing Eye' within the triangle at the center, and the acacia instead of the radiant beams, primarily). It is possible that Mt. Nebo's is a copy or variation of the Watson-Cassoul Apron, or perhaps it was a prior prototype. 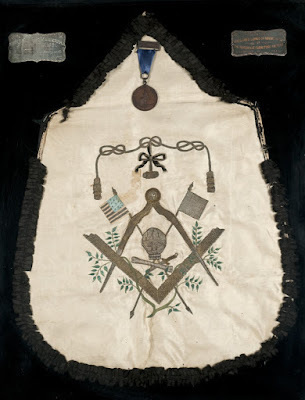 A third Washington apron (and the best-known one) is known as the 'Lafayette Apron,' which was presented in 1784 by the Marquis de Lafayette, and is now in the Museum of the Grand Lodge of Pennsylvania in Philadelphia. Its design is quite different from the other two. The Lafayette Apron is said to have been sewn by the hands of Madame Lafayette herself, and so it carries a more romantic legendary status. Masons often mistake this apron for the one Washington wore at the Capitol cornerstone ceremony. And the Mt. Nebo story of their apron seems to combine the histories of the other two aprons. Nevertheless, it is possible that Lafayette did in fact present two aprons to his famous Masonic brother. That said, the curators at Mount Vernon are obviously convinced enough by Mt. Nebo's provenance to confidently display it as authentic. And there's no reason to question that Washington really did have all three aprons presented to him in the early 1780s by his Brother Masons. It's a shame American history isn't properly taught in schools anymore. In Mrs. Adams' fifth grade class grade I first heard Thomas Jefferson's famous pronouncement; "Peace, commerce, and honest friendship with all nations — entangling alliances with none." 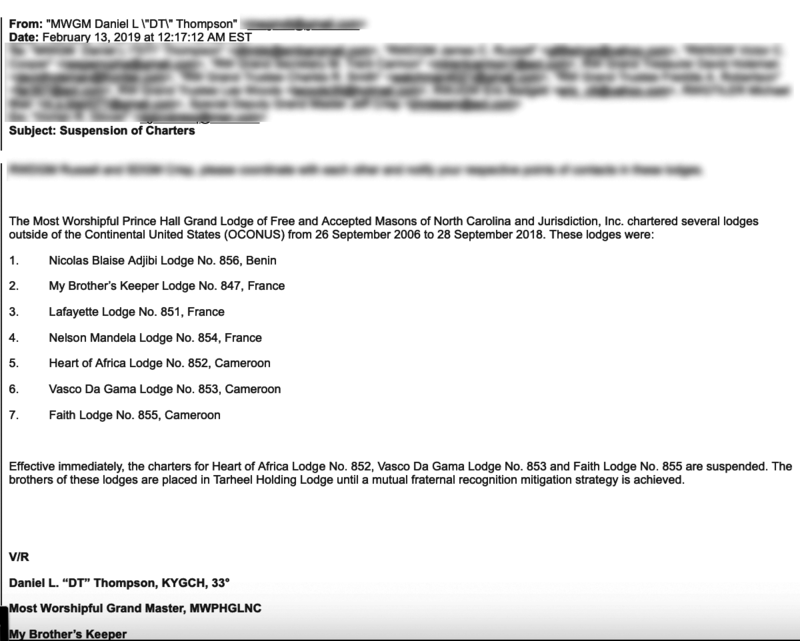 At the beginning of February, the Grand Lodge F&AM of Utah suspended recognition of the MW Prince Hall Grand Lodge of North Carolina in protest over a number of lodges established in Africa and France over the years that encroached on established Masonic jurisdictions (see previous story HERE). The announcement was undoubtedly something of an unpleasant welcome to the new job for North Carolina's Prince Hall Grand Master Daniel L. 'DT' Thompson, who had just been installed in late December. 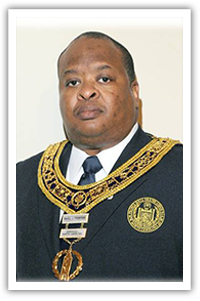 His predecessor, Milton F. 'Toby' Fitch, had served as Grand Master for fifteen years (long grand master terms are not that unusual in some Prince Hall jurisdictions). 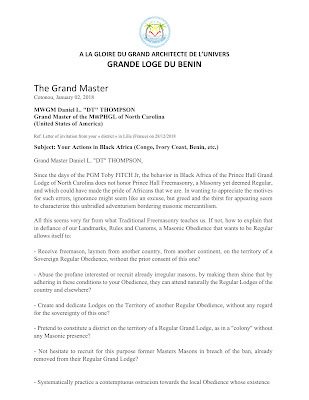 During his tenure between 2005-2018, Fitch had issued charters for lodges that invaded longstanding Masonic jurisdictions with their own established grand lodges in Cameroon, Benin, and Congo, and even a handful of French lodges, announcing a District Grand Lodge of France for North Carolina on his way out the door. 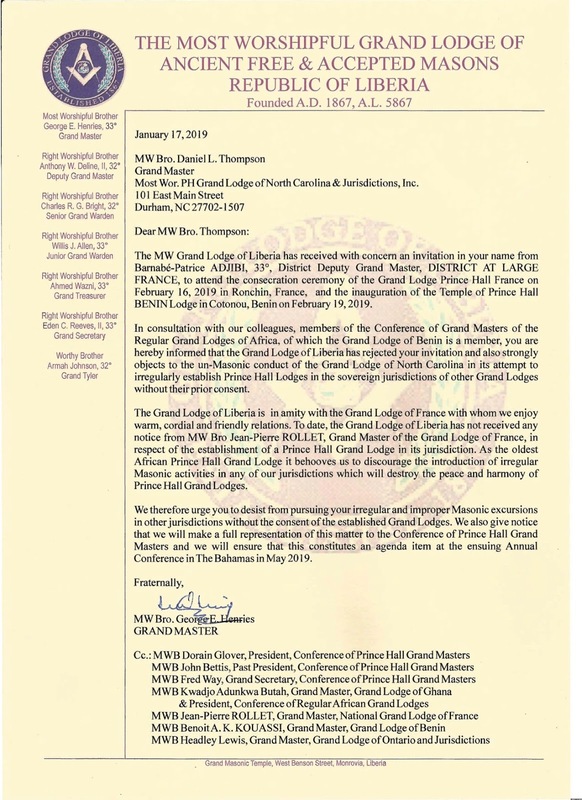 It seems that GM Thompson is taking nearly immediate steps to try to extricate North Carolina's PHA Masons from the international imbroglio that Fitch left behind for them. 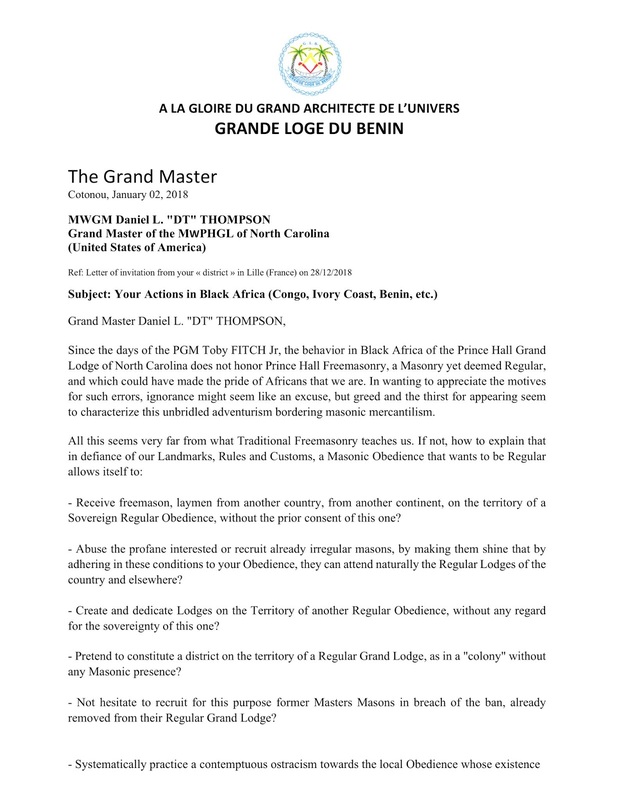 On February 12th, Thompson issued a letter revoking the charter of Nicholas Blaise Adjibi Lodge 856 in Benin. 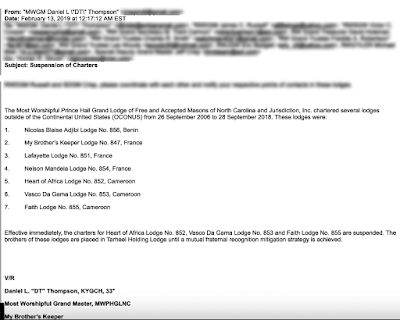 The next day on February 13th, Thompson circulated an email announcing the suspension of the charters of Heart of Africa Lodge 852, Vasco Da Gama Lodge 853 and Faith Lodge 855 - all in Cameroon. 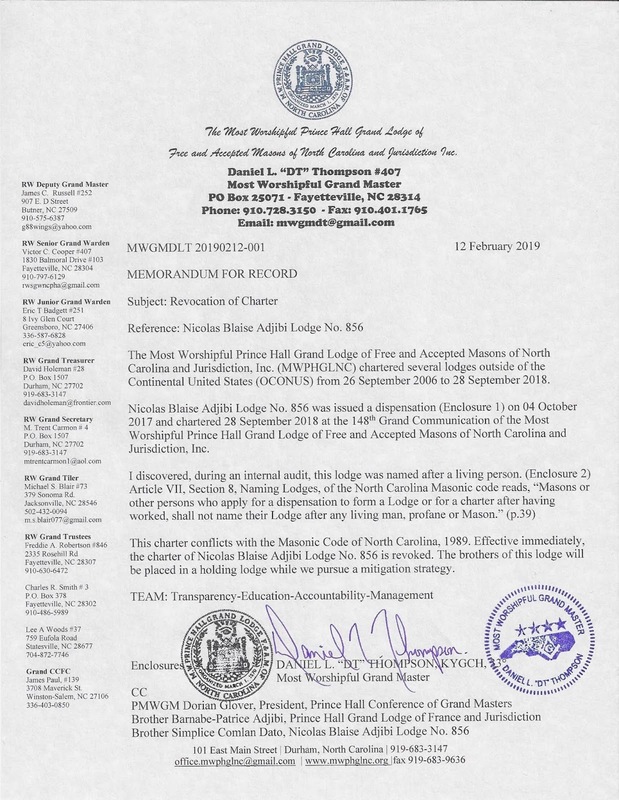 The members of all of these lodges were placed in MWPHGL of NC's Tarheel Holding Lodge until a mutual fraternal recognition mitigation strategy can be satisfactorily worked out. The French situation is a bit stickier to try to work out. 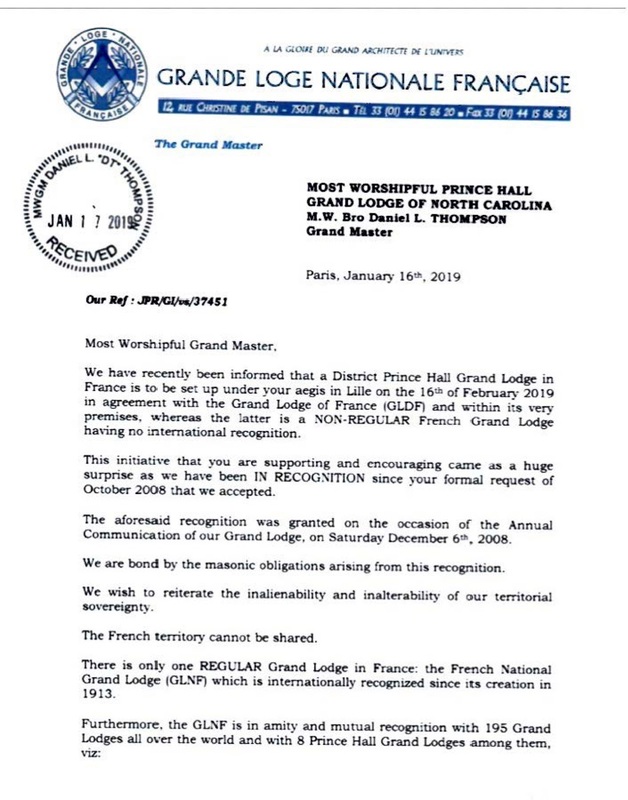 In researching my earlier post about this, I discovered references online that showed PGM Fitch and/ or his predecessors may have entered into various agreements with not one, not two, but all three of the major French grand lodges over the years. 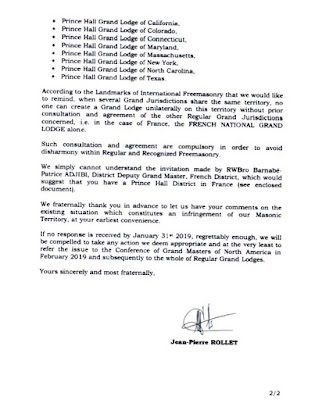 The Grande Loge Nationale Française (GLNF) is currently in amity with UGLE, all 61 of the mainstream North American grand lodges, and eight U.S. 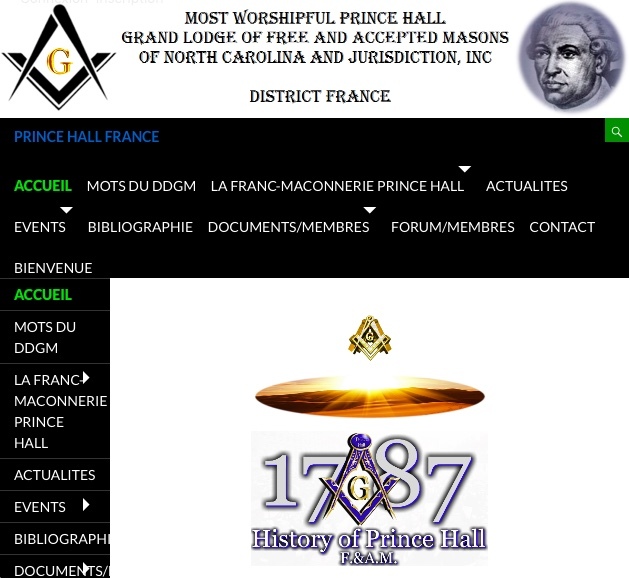 Prince Hall Affiliated grand lodges (including North Carolina since 2008). 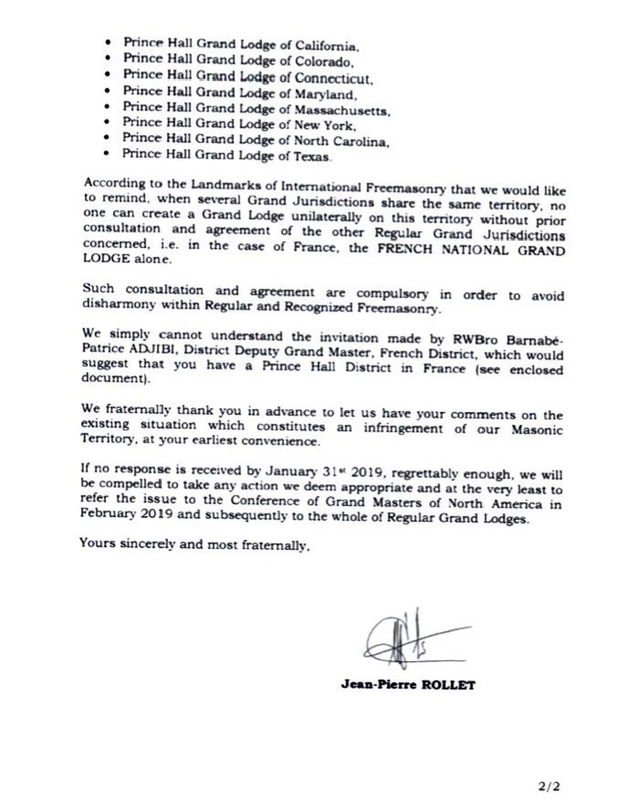 As reported previously, the GLNF sent a letter last month objecting to the consecration of the new District Grand Lodge - France by North Carolina that was to take place this month (see below). 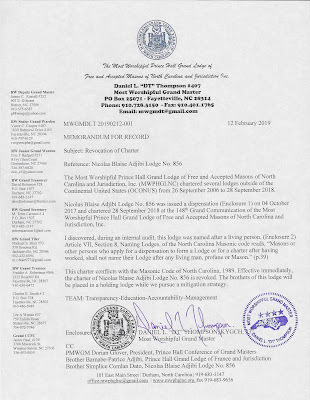 But until recently, the MWPHGL of North Carolina webpage had previously listed recognition from the Grand Orient de France (GOF). (Note: unfortunately there is no Internet Archive capture of their fraternal recognition page prior to today, and I neglected snag a screen shot before). 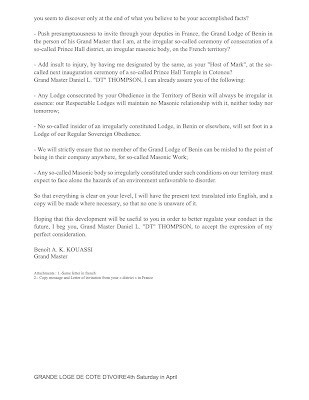 The GOF may be the largest grand lodge in France, but it is overwhelmingly considered irregular by the bulk of the Masonic world for regarding a Volume of Sacred Law as optional for opening lodge, accepting atheists as members, admitting women, and openly engaging in and advocating political activities (among other issues). 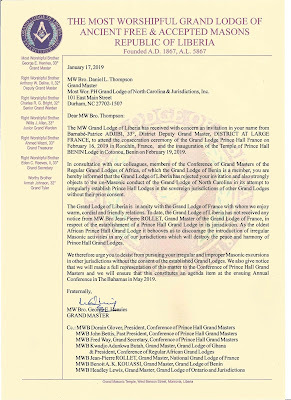 There is no question that the GOF does not adhere to what mainstream Freemasonry regards as the most basic landmark requirements of the fraternity, regardless of its popularity. 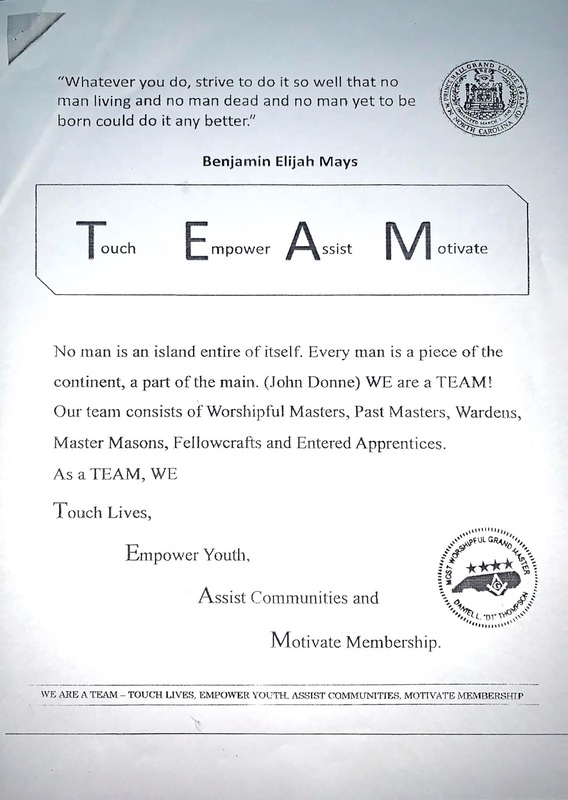 Because the GOF is institutionally one of those organizations that's so open minded that they won't even side with themselves in an argument, some Prince Hall grand lodges 30 and 40 years ago sought their recognition when they were being shunned by the majority of the predominantly white Masonic world. 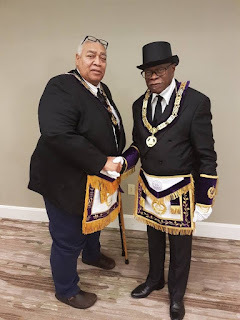 But as the mainstream Masons became more accepting of Prince Hall Masonic origin and regularity in the late 1980s and early 90s, that GOF recognition became something of a diplomatic liability. 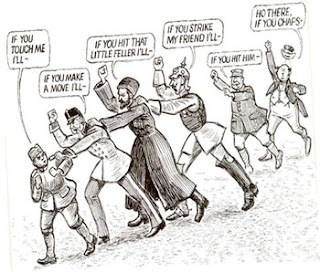 And not every grand secretary in the world has always paid strict attention to the details of international regularity and recognition issues. If it wasn't a typo, that website notation may have been an artifact hanging around in the files of the MWPHGL of NC from long ago that was forgotten. Or not. And then to put a cherry on the top of this mess, it seems that PGM Fitch had also recently worked with the Grande Loge de France (GLdF) in setting up some of his African lodges, including establishing up a brand new new PHA grand lodge in Congo in 2015. The GLdF is the odd man out in French Masonry. 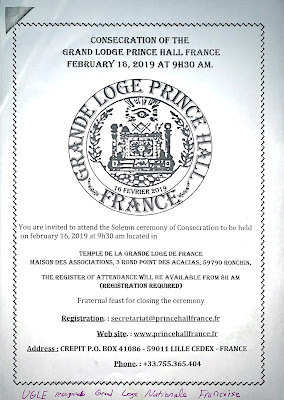 It is the second largest grand lodge in France, perfectly regular in origin and practice, just not widely recognized outside of the country. The mainstream world has favored the UGLE-backed GLNF for more than 60 years. 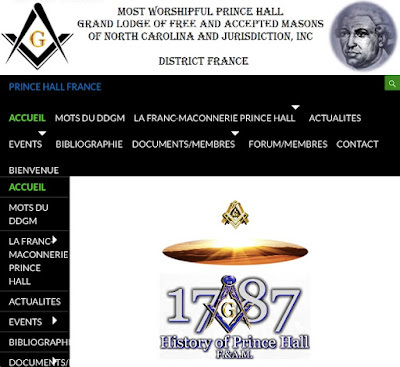 As of today, the MWPHGL of NC webpage now lists the Grande Loge de France as the one they currently recognize in France, which clearly has casual observers scratching their collective noggins. It certainly conflicts with the GLNF's record keeping. 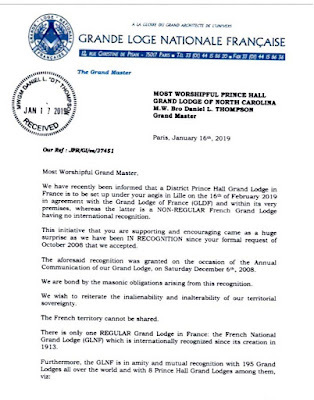 The upshot of all of this is that PGM Fitch had danced with at least two, and maybe all three, of the main grand lodges in France during his tenure, along with sticking his own flag in the ground and chartering new PH lodges in that country. All of this on top of the messes in Africa. Now, MW Thompson is stuck with trying extricate himself from those entangling alliances, which he seems to be doing so with admirable speed. His biography shows a background in military intelligence and law enforcement, and with a Masters degree in Homeland Security. I suspect he's just the guy for the job. The Society of Blue Friars was founded in 1932 for the express purpose of recognizing outstanding Masonic authors. Authors like Arthur E. Waite, Harold V.B. Voorhis, Arturo de Hoyos, Thomas Jackson, Mark Tabbert, Robert G. Davis, Alton Roundtree, Michael R. Poll and Josef Wäges are just a few prior Blue Friar honorees. They even inducted this Dummy as Friar No. 101 back in 2012. 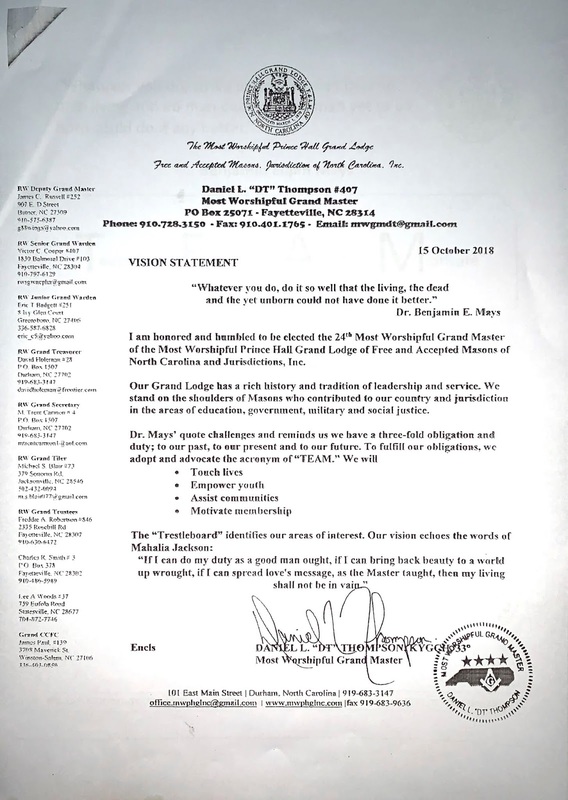 Since 2004, the Grand Abbot of the Society has been Dr. S.Brent Morris, Masonic author, and editor of the Scottish Rite Journal and the Scottish Rite Research Society's annual Heredom collection. Breaking with prior, longstanding tradition of announcing the Blue Friar at their annual meeting during Masonic Week, the Grand Abbott has announced the 2019 Blue Friar ahead of time as Piers A. Vaughan. Worshipful Brother Piers Vaughan has one of the most diverse and fascinating backgrounds for the study and understanding (and explanation) of Masonic, appendant, and other esoteric orders you will ever encounter. 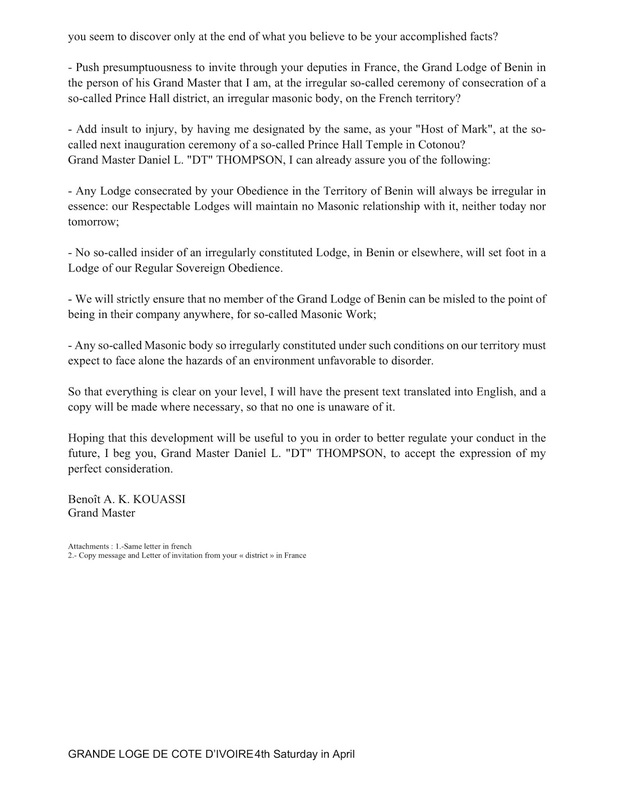 Originally, he is from England, and he belongs to lodges in England, Canada, and the U.S. Throughout his life he has lived in several European countries, Canada, and now resides in New York. He has a Master's degree in Divinity and another in Experimental Psychology; experience in both the Anglican and Catholic denominations and traditions; an MBA in Business Studies; a teaching diploma in Music; and much, much more. Piers has made extensive studies in history, alchemy, language (he has translated many texts from French to English), symbolism, cultures—truly what anyone would acknowledge to be a "Renaissance Man." Appropriately, one of his most recent books is 2017's outstanding Renaissance Man & Mason. He is also is the proprietor of Rose Circle Publications that is a source of other fascinating books along similar explorations of esoteric thought that mirror his eclectic mind and interests. Upon being named a new Friar, each inductee is expected to present a short paper at the Masonic Week gathering. Piers' topic will be "Did St. Martin Influence the RER Rituals?" 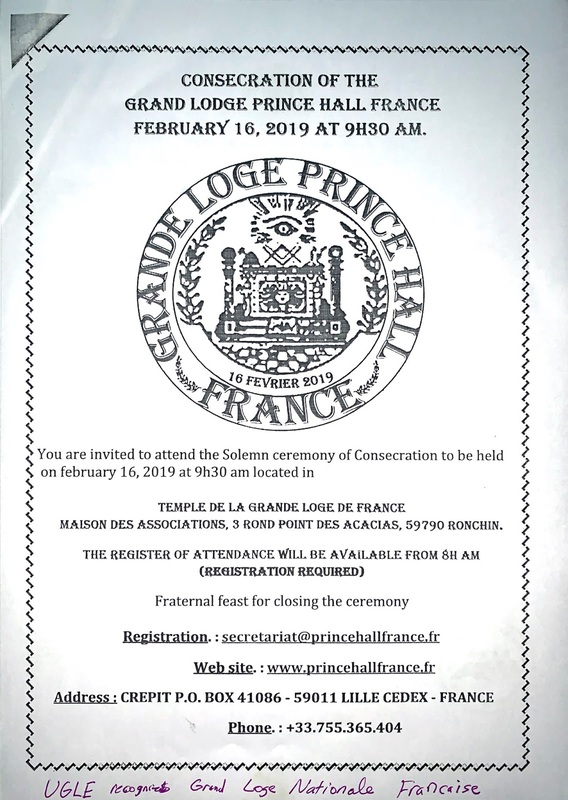 If you are at Masonic Week on Friday February 22, 2019 be sure to stop in for 10:30 AM-11:45 AM - All are welcome to attend.